Baryonyx is a recently discovered dinosaur that appears to have been especially well suited for fishing. 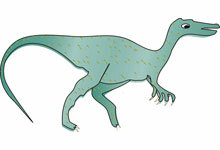 If so, it is the only known fishing dinosaur. Baryonyx's nostrils were set back from the tip of its long, narrow, crocodile-like snout, perhaps so it could stick its nose underwater and still breathe. It had a mouth full of small, sharp teeth -- twice as many teeth as most dinosaurs -- which were probably great for catching fish. Baryonyx, meaning "heavy claw," takes its name from the two huge, curved claws, more than a foot long, that seem to have been attached to its front feet, where they would be handy for spearing fish. However, since the claws were not attached to the skeleton, scientists are not certain whether they were on the front or back feet . Another piece of evidence for Baryonyx's fishy diet is that scientists have found the remains of a fish dinner where its stomach would have been. Because of its long front legs, scientists believe Baryonyx may have walked part of the time on all four legs. Baryonyx was discovered in 1983 by an amateur fossil hunter in Sussex, England, and is related to the Spinosaurus.